Reacts with a common epitope of human major histocompatibility (MHC) class II antigens, HLA-DR and DP. Reacts with a common epitope of human major histocompatibility (MHC) class II antigens, HLA-DR and DP. Human MHC class II antigens are transmembrane glycoproteins composed of an alpha chain (36 kDa) and a beta chain (27 kDa). 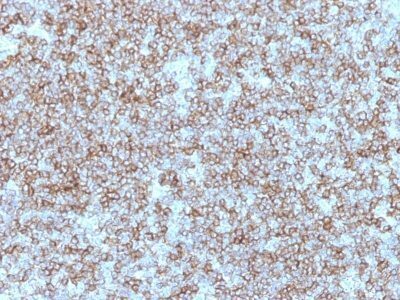 They are expressed primarily on antigen presenting cells such as B lymphocytes, monocytes, macrophages, and thymic epithelial cells and are also present on activated T lymphocytes. Human MHC class II genes are located in the HLA-D region that encodes at least six and ten chain genes. Three loci, DR, DQ and DP, encode the major expressed products of the human class II region. The human MHC class II molecules bind intracellularly processed peptides and present them to T-helper cells. They, therefore, have a critical role in the initiation of the immune response. It has been shown that some autoimmune diseases are associated with certain class II alleles. Catalog number key for antibody number 1129, Anti-MHC-II (Bra-14) The prefix indicates conjugation, followed by the antibody number and size suffix.